Following the death of President Hugo Chávez yesterday hundreds of thousands of Venezuelans have gone into the streets in mourning. Beyond Venezuela, many Latin American countries have also declared three days of mourning. Last night, from around 6pm till well after midnight, huge crowds of people gathered in all the main plazas of cities and towns to rally, mourn, pray, and sing. Otherwise the streets were quiet. At 8.00 this morning units of the National Bolivarian Armed Forces (FANB) around the country fired 21 shots, to begin the tribute to be paid to Hugo Chávez. One shot will be fired from then on each hour. Minister for defence, Diego Molero Bellavia said he had received "thousands" of expressions of solidarity from members of the army of all ranks, many requesting that Chávez's remains be taken to the Pantheon, so that they can be "next to another great man, Simon Bolivar". Seven days of official mourning have been declared, and schools will be closed until Monday. Some public transport will be free until Saturday. 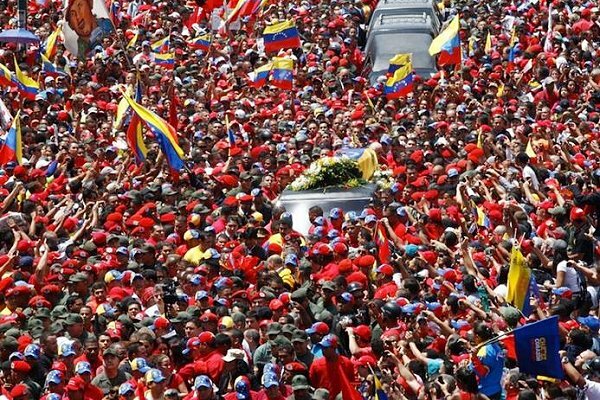 People are now paying tribute to Chávez, with a car parade leaving from the Military Hospital where Chávez was being treated at 10.45 am, travelling around the main streets of Caracas, and ending in the Military Academy. Hundreds of thousands of people are paying homage to the parade as it passes, and speeches are currently being given at the academy. In other parts of the country, large screens have been erected in plazas and people are watching the homage there. The rallies in the plazas have also continued all morning and into this afternoon. A chapel of rest has been set up in the Military Academy and will stay there until Friday. So far, despite some rumours that were spread of ransacking, things in Merida are calm. Most shops are open, with only minor amounts of panic buying, transport is working as normal, most shops and houses have put up their Venezuelan flag, and people of both sides of politics are being peaceful and polite. Maduro, speaking to the press midday today said that, "His (Chávez's) sprit is free, its going about full of light, protecting our people. Our people are in the streets expressing their solidarity, their feelings... we have checked with all the governors, with the National Bolivarian Armed Forces, and there is peace and tranquillity in all of the country". The state funeral for Chávez will be held on Friday. Heads of state from many countries, as well as grassroots leaders are expected to attend. According to the constitution, new presidential elections must be called in 30 days. In the meantime, the current vice-president, Nicolas Maudo, will temporarily fill the role as president. The president's death has also been felt across the continent. Last night the presidents of Ecuador, Bolivia, and Nicaragua paid homage to Chávez, their speeches broadcast to all those mourning in the Plazas. Evo Morales of Bolivia said he was "hurting" and "destroyed" by the news, and Rafael Correa of Ecuador committed to "continue his [Chávez's] dreams" for regional integration. Brazil's president, Dilma Rousseff, declared three days of national mourning in her country, with flags at half mast, as have the presidents of the Dominican Republic, Uruguay, Cuba, Chile, Bolivia, Ecuador, Nicaragua, Belarus, Iran, and Argentina. The United Nations Human Rights Council held one minute's silence for Chávez this morning, at the request of the Cuban ambassador, Anayansi Rodriguez. She also read a declaration made the Community of Latin American and Caribbean States (CELAC). The CELAC, which is made up of all countries of the Americas except the US and Canada, expressed its "profound solidarity with the people and government of the sister Bolivarian Republic of Venezuela, and particularly with the family and friends of comandante Chávez". "It's difficult to accept this painful event. His passing moves all of us. An exceptional, extraordinary, respected, and admired man at a world level has stopped physically existing," the statement said. The general secretary of UNASUR, Ali Rodriguez also remembered Venezuela's president, saying, "He put everything into the reunification of this great homeland [Latin America]". A range of famous intellectuals and artists have also expressed their pain and solidarity, including Atilio Boron, Horacio Gonzalez, Jimmy Carter, Silvio Rodriguez, Aleida Guevara, and Oliver Stone. U.S actor Sean Penn said, "Today the people of the United States have lost a friend that we never knew we had, and the poor people of the rest of the world have lost a champion". Other presidents from around the world have also expressed their condolences, and political and activist groups have put out statements of solidarity, many of which Venezuelanalysis.com will publish in an article later today. Hugo Chávez died yesterday after almost two years battling cancer.